FLASH arrived at Last Hope on Long Island on a Kentucky transport. He didn’t run here, even though some JRT* fans think he could. 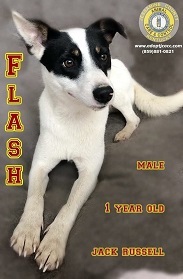 FLASH was in the hands of a relay of kind drivers who devote their free time to shelter rescue. This entry was posted in 6 to 12 Months, Adopted, Adopted Dogs, Dog Center, Dogs. Bookmark the permalink.